As you might imagine, I’m the guy that friends and family go to when they have computer questions. It makes sense. I enjoy technology, I’m always playing with something related to computers, the internet, web sites, or who-knows-what. 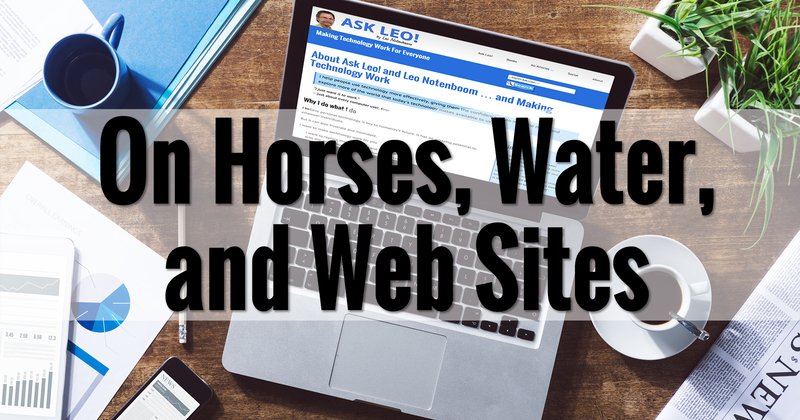 In fact, I built an online business around it: Ask Leo! Since I’ve built a few successful online presences and web sites, one class of questions I get from time to time has to do with how to do that. Be it for an individual practitioner, a retail establishment, or some other endeavor – online or off – “How should I set up my web site?” is pretty common. It also opens the door to a small, though in my opinion quite manageable, can of worms. 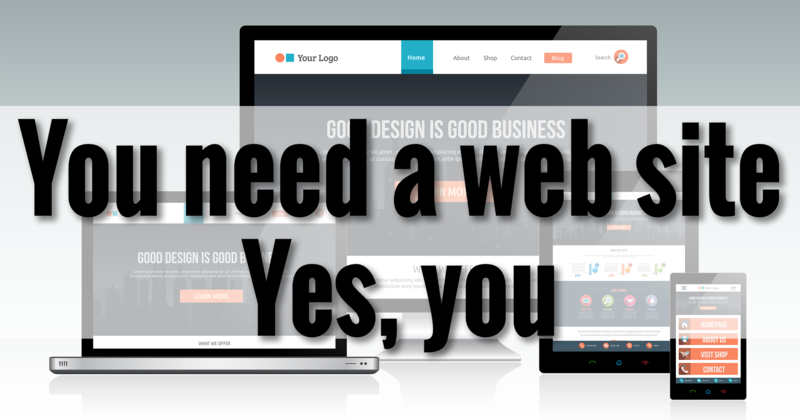 “Great, I have a web site – now what?” is perhaps an even more important question. There are many more opportunities than just having a few pages on the internet. What’s more frightening to me are folks doing business or promoting a cause with no web site or online presence of their own … or at all. At a minimum, it’s a huge missed opportunity, and at worst, it’s putting your fate in the hands of someone or something that doesn’t care if you succeed, fail, or even exist. What it’s taken me some time to learn is this: you can lead a horse to water, but … well … you know the rest. So, instead, I’ve decided to simply point out where the water is. Stick around if you’re thirsty. Next Post: You Need a Website. Yes, You. To me, it’s not just about that business’s success — it’s also about serving the customer well. With a proper online presence a customer can find their location, hours, phone number, and so much more. It doesn’t have to be complex; often, a one-page site can do it all. But if they don’t care enough to even do that, then they are sending a very different message. You can’t make a horse drink water if he isn’t thirsty. But you can make him thirsty by salting his oats. I take it that this new site is going to add lots of salt to our oats. More power to you! Hi Leo!! I been one of your “followers” for a long time!! I enjoy your way to “manage computers problems”. It is my first time visiting this side!! I like it!!! Happy New Year and Thank you for all your help!!! Thanks Leo. I’m very excited to see where this goes! Thanks for being Leo who we all count on for the truth in a crazy world .. Thanks again.. jim p.
Unfortunately I’ll have to disallow “look at my site” kinds of links in comments. Basically they are indistinguishable from webspam, and that’s not a direction I want this site to go. Thank you Leo . For all your help in the past…..long life to you. You’ve helped me with some difficult situations that Windows could’nt or Microsoft . I still dont know why their 2 different entities , lol,or for that what matter a rather waste of time that I dont have much of being a senior , enough said for that , mate . Something about splitting fine hairs ,….mine are already split enough when I can find them and would’nt spend precious enough time for boulderdash coming both ways from them . You’ve been caught in their trap more than enough , with possible strokes from their abusive actions , with a possibility of stroke , from their feedback on important issues , that are’nt swiftly and efficient on a course of immediate problem solutions . Thank you Leo for at least helping us find a penetrable solution for their ongoing problems as seniors . I wish you the best of 2016 and the challenges that Windows 10 will present to us , this coming year , lol . All the Best , Leo for the years you’ve spent with us…..and many more . It is not a business, it is just for my own enjoyment and perhaps to provide enjoyment to others. Interested but hope this is not just another one of those JVZoo online marketing schemes where you push a product and get affiliate marketing money. Ugh. No, this ain’t that. I hate JVZoo as much as you do. I sincerely regret having purchased one thing via them and getting inundated thereafter. While I may include affiliate links eventually to some things I’ll recommend along the way, that in no way is the point of this project. Oh, and yes, I’ll be laying some groundwork for a few weeks. OK, Leo, I shall make like the Ancient Mainer and choose 1 in 3. But please don’t take too long getting to the heart of the matter – I have a website to build, which is why I was so excited at this new venture, and I suspect that (as with most things) it is far better to get it right initially than try to salvage afterwards. At least I know that your words of wisdom will be well worth the wait. Oops, Mariner. So much for my attitude to language! I desperately need this info and a little inspiration to get moving. Can’t wait for your pearls of wisdom. Many thanks for all your wonderful help. After the age of horses ( as in leading), came the age of ‘driving traffic’. Let’s figure that one out …. Leo, I spent countless months learning and improving my HTML, years perfecting my business site and — now that I’m retired — it will be great to finally learn what I could have /should have done to get that first customer via my website instead of through pounding the bushes! Old dogs, new tricks, etc. Thanks Leo, I look forward to it. Sitting here with bated breath. At84 I can’t hold that too long. In 2013 I was Age UK Internet Champion and this year had an MBE for helping seniors with on line problems. I just need to get through to more of them, as I think the net is not just fun for oldies – these days it is vital. I have done database programming in the past but would prefer not to have to learn HTML, though I don’t mind ‘tinkering’ with it occasionally. This old horse is thirsty and looking for a trough. I really like your floating social media buttons and want something similar on my website. I just signed up with Bluehost and have a lot of WordPress social media plugins to choose from and am struggling to find a plugin that has floating buttons and works well. On some of the plugins which get great reviews, the negative reviews come from tech savvy people who point out clicking on the buttons also sends data to the plugins. I’m not tech savvy and am completely confused. I don’t know if you have any recommendations for WordPress social media button plugins, but if you do I’d sure appreciate your thoughts. A big thanks. Last week I thought you said you were going to tell how to build a website so I waited. I need to do it ASAP. Would you suggest just opening a Word Press account and start with a template? This site, over the coming weeks, will address exactly that. It’s most definitely not a quick one or two post kind of thing to do it properly. While I do recommend WordPress, I recommend hosting it on your own domain. I can’t begin to describe how timely this new site is! I am starting a new consulting business and I’m very aware of the importance of branding & online presence. I managed to figure out how to start a blog using WordPress hosted on my own domain but it was a LOT of trial & error & I need to make sure I get my business site right without all the missteps. I can’t wait for your first post because I know it will be what I need to know, explained in a way that non-“geeks” like me can follow! So glad you recognized the need for this kind of information. Interesting experience getting here. I had read this post earlier in the week and wanted to re-read it, but have deleted the email. I recalled that the website was biz.askleo.com, so what I typed into Firefox was https://biz.askleo.com and was greeted with a big yellow warning from Firefox that they couldn’t confirm the site was secure. Knowing I could trust Leo and that I was not sending confidential information, I told Firefox to proceed anyway. What I was greeted with is “This is an example of a secure page https://secure.pugetsoundsoftware.com. Visit Ask Leo!” After dropping the https:// and just going to biz.askleo.com, I got to this page. Yep. For technical reasons biz.askleo.com is currently http, not https. Fixing that actually requires I move it from one server to another (long story), but I do plan to in the coming days. Hi Leo. I “operate” a website on behalf of a small homeowners association. We keep a password-protected directory and minutes to the meetings, post pix of activities, as well as helpful local items of interest and links. I’m interested in getting our residents more involved in using the website. How to attract activity, receive comments directly from the site, etc., are things I know to I should learn. Is there a way to back up our website “just in case”? What else should I be doing so the site doesn’t become stagnant? We don’t sell anything except community-mindedness and working together. I set up the site using Weebly because it’s free. A sincere THANK YOU for all you do for us dummies. These are all great questions I expect to address in the coming weeks. Thanks! You need to be familiar with the directory submission practice before you can suggest your site properly. promoting on radio and televisions and so forth. good thing, or a bad thing.